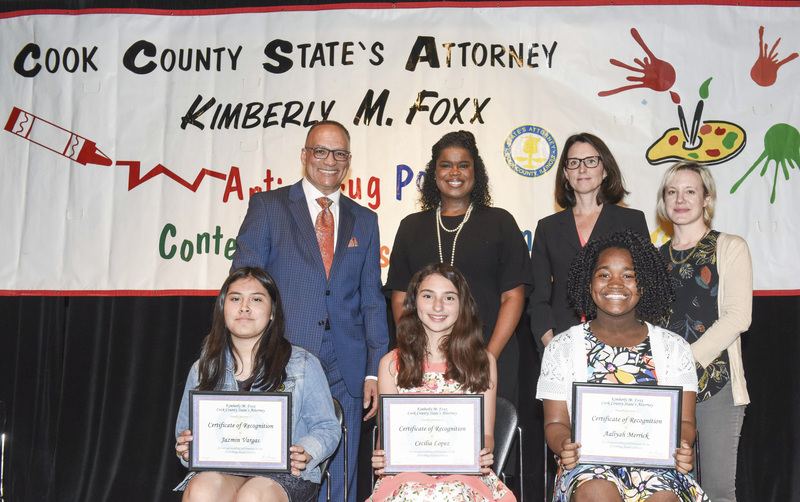 Cook County State’s Attorney Kimberly Foxx recently honored 13 elementary school students for their award winning artwork that will be featured in the State’s Attorney’s 2018 Anti-Drug calendar. The annual contest is open to all sixth, seventh and eighth grade students in Cook County. This year approximately 800 entries were submitted. The three first place winners will each receive scholarships to the School of the Art Institute. In addition to having their artwork appear in the State’s Attorney’s 2018 calendar, all winners received tickets to Chicago Sky and Chicago White Sox games; tickets to a Goodman Theater performance and the Brookfield Zoo; and a catered lunch provided by Vienna Beef. The awards ceremony took place on May 31, 2017, 1:00 p.m. at the National Museum of Mexican Art and ABC 7 Eyewitness News Sports Anchor Jim Rose served as emcee for the event. Pictured are the 6th grade winners of the Cook County State’s Attorney’s Poster Contest: (sitting, left to right): Chloe Unzueta, St. Leonard School; Kristen Smith, Calvary Academy, South Holland; First place winner Mayra Moreira, Luther Burbank School, Chicago; and Olivia Antolak, St. Patricia School, Hickory Hills. Also pictured are (standing left to right) Jim Rose, Sports Anchor, ABC 7 Eyewitness News, State’s Attorney Kim Foxx, Jennifer Coleman, Chief, State’s Attorney’s Narcotics Bureau and Kate Hampel, Administrative Director of Youth and Outreach Programs School of the Art Institute of Chicago. Pictured are the 7th grade winners of the Cook County State’s Attorney’s Poster Contest: (sitting, left to right): Jazmin Vargas, James Shields Middle School, Chicago; Cecilia Lopez, Gloria De Lutheran School, Chicago; and First place winner Aaliyah Merrick, St. Agnes Catholic School, Chicago Heights. Not pictured – Megan Boykins, Calvary Academy, South Holland. Also pictured are (standing left to right) Jim Rose, Sports Anchor, ABC 7 Eyewitness News, State’s Attorney Kim Foxx, Jennifer Coleman, Chief, State’s Attorney’s Narcotics Bureau and Kate Hampel, Administrative Director of Youth and Outreach Programs School of the Art Institute of Chicago. 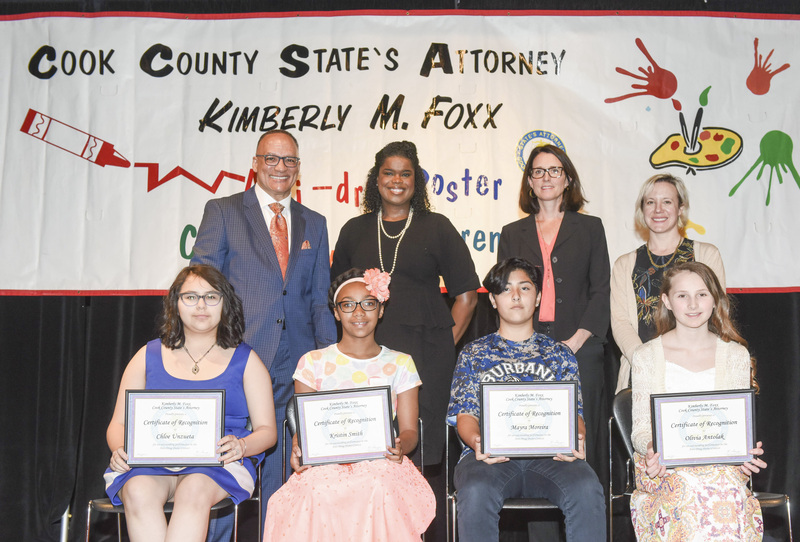 Pictured are the 8th grade winners of the Cook County State’s Attorney’s Poster Contest: (sitting, left to right): Jenna Roberts, St. Patricia School, Hickory Hills; Judith Salgado, James Shields Middle School, Chicago; First place winner Otto De Leon, Robert J. Richardson Middle School, Chicago; Dylan Williams, Calvary Academy, South Holland; and Aisha Al-Amin, Calvary Academy, South Holland. 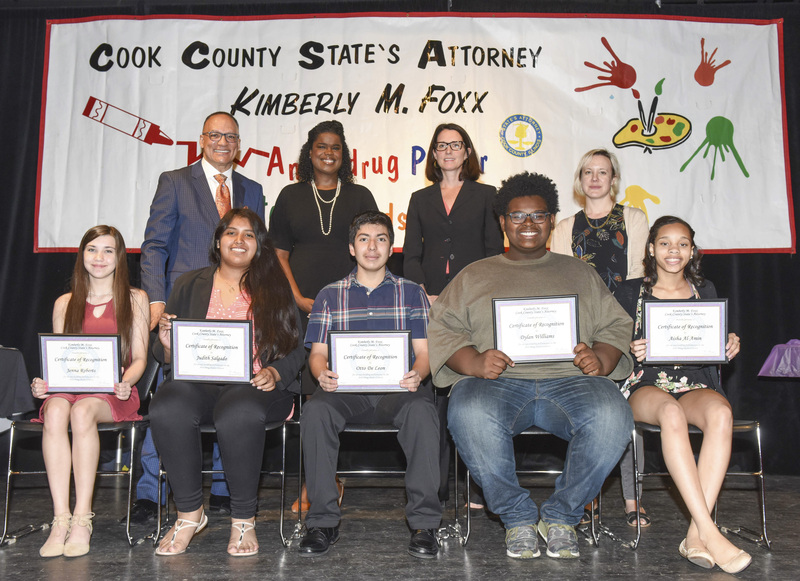 Also pictured are (standing left to right) Jim Rose, Sports Anchor, ABC 7 Eyewitness News, State’s Attorney Kim Foxx, Jennifer Coleman, Chief, State’s Attorney’s Narcotics Bureau and Kate Hampel, Administrative Director of Youth and Outreach Programs School of the Art Institute of Chicago.